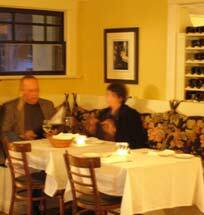 A true destination dining experience, the Black Cat is not only one of Cambria's finest dining establishments, but one of the top restaurants on the entire Central Coast. The Black Cat reflects the sophistication now infiltrating the Central Coast, yet still retains a casual atmosphere. The entire restaurant seats 42 guests. Smaller groups can be accommodated in one of our three dining rooms. We serve Cappucino, Espresso, French Press Coffee and Tea. some extent daily to reflect the seasonality of the ingredients. Owner/Manager Deborah Scarborough serves as maitre d'. She has a sincere approach and an unusual gift at making each guest feel at home and special. The service is attentive, unpretentious and refined. The Black Cat is small with only 45 seats and this is part of what makes it such an intimate dining experience. Deborah believes the focus for each guest should be the food, the wine and each other.